This week we are spending a lot of time talking about school and class rules and authority figures. 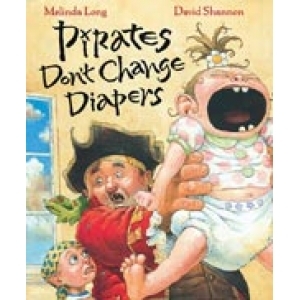 Today we read Pirates Don't Change Diapers. We connected what pirates don't do with what kindergartners should not do. I found paper plate pirates all over the internet. I used a combination of all of the ideas I found. First we colored the plates peach or brown. Then we glued on the red hat (to make the hat I cut a paper plate in half and used it as a pattern). Then we glued on the black eye patch (3 X 2 1/2 rectangles). Next came the wiggle eye and mouth, nose, and strap of the eye patch. We finished the project up by gluing on the ties (1 X 3) and finger painting white polka dots on the hat. I just pinned that. What a cute idea!!! April- that is precious! And boy do the kids love pirates for some reason! :) Thanks! April, I love this! What a cute idea to connect it to classroom behavior and the pirates are just too cute! Very good idea. Congratulaciones. Transporte for sharing.